Trampoline with a computer and a handlebar, for both home and commercial use, highest safety standard. Protective spring cover, easy to use, protection against injury. 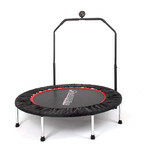 Trampoline with Handlebar inSPORTline 122 cm in diameter has a computer and is ideal for keeping fit whether you are at home, outside or visiting a fitness centre. Losing weight and strengthening your body has never been so fun! The computer displays time, burned calories and the number of jumps per minute. The trampoline has a detachable handlebar that can be adjusted to 4 positions (99-123 cm). With a handlebar, you can exercise also your arms and back, using them to propel your body as high as possible. This very durable trampoline has the weight limit of 110 kg, so it can be used by an entire family. Children especially have boundless reserves of energy. However, a trampoline also presents a great way to relax and stretch after a day behind a desk. By using it, either at home or a club, you will perform exercises easy on your joints that will improve your coordination (however, don’t use the trampoline as a springboard). The trampoline meets the EN-13219 and EN-913 European safety standards. If you don’t know how to pick a trampoline, check out our guide. An important parameter to take into account when choosing a trampoline is its size. Generally speaking, the bigger the trampoline, the more fun you have. An entire family can use a bigger trampoline, as well as your children’s friends. There are many diameters to choose from. From compact 90 cm to the 460 cm maximum diameter. It is also important to take into account the space needed. It is recommended to keep at least 1 m of free space along the entire length of the trampoline. That means that if you have a trampoline with 457 cm in diameter, you need approximately 6.5 m of space. If you want to place your trampoline indoors, the maximum recommended diameter is 140 cm. By observing the weight limit of the trampoline, you significantly increase the service life of the jumping mat and the springs. The weight limit corresponds with the total weight of all users currently on the jumping mat. It is not recommended to exceed the weight limit. Height of the jumping mat goes hand in hand with the trampoline's diameter. The larger the jumping mat, the higher it is placed. Safety net significantly improves the safety of a trampoline. They prevent the users from falling off the jumping mat and getting injured. Stepladder makes access to your trampoline easier. Trampoline handle allows you to hold on while jumping. Handles are usually part of trampolines with smaller diameter, suitable for fitness training.